Kenya’s all time premier league top scorer Maurice ‘Sonyi’ Ochieng was over the weekend honored for exemplary performance during his hey days as a striker in the Premier league playing for Gor Mahia fc. Sonyi’s 26 goal record in a single season of the 1976 Kenya premier league championships has not been broken to date, 34 years down the line. 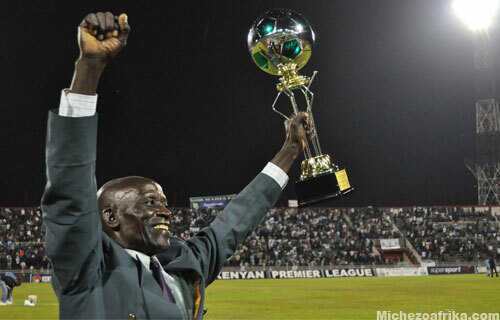 While presenting the Standard group sponsored award on Saturday before the Gor Mahia vs AFC Leopards clash at the Nyayo stadium, renowned Sports Editor Robin Toskin lauded Sonyi’s outstanding contribution to the development of Kenyan soccer and urged more Kenya sports men to leave behind an outstanding legacy that will be remembered long after their retirement from the industry. Close by to narrate Sonyi’s bravery in the league was another legendary soccer star Joe Kadenge who showered his former opponent with praise as a lethal striker with no mercy in front of goal. “This man was a like a lion my friend, he had no mercy with goalkeepers. Most of them used to run away from goal when they see him because he would kill you with the shots-Hapana mchezo, huyu alikuwa ni moto wachana na hawa vijana wa siku hizi eti anafunga bao kumi na mbili and he is top scorer, our days were tough.” He said. Kadenge also thanked the standard group for the initiative to recognize Sonyi for having left a non erased mark to date with his scoring prowess. The record holder Sonyi was more than elated with the award saying it brings back the memories of his youthful times when he was a force to reckon with in the premier league. “This match here today (AFC vs Gor) reminds me of our days together with my friend here Kadenge playing against me. Those days there were no awards and no money in soccer like it is today. We played for passion and the love of the sport without caring about money. Am sure if it were today we would be some of the richest people in this country but then that is just but a wish.” He said. Sonyi has challenged the current crop of players to try and break his 34 year record of scoring 26 goals in one season.